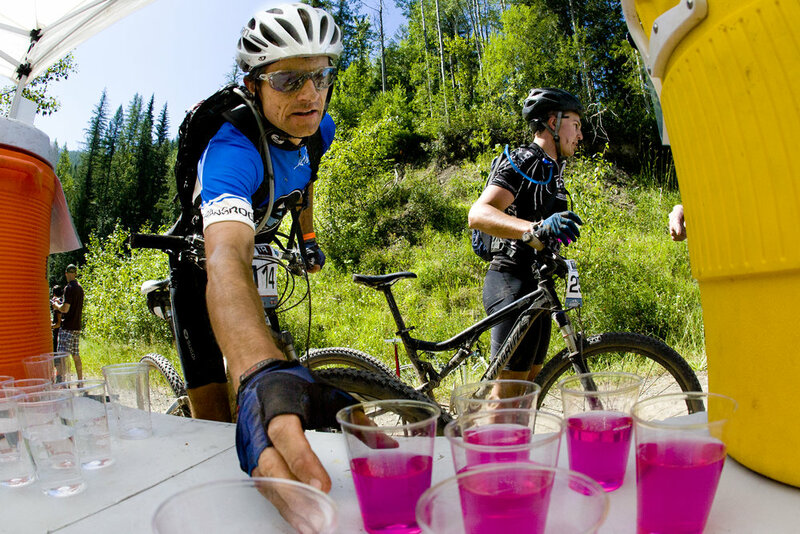 The TransRockies Race Series team pioneered the camp-to-camp stage racing format when it adapted the TransAlp Challenge event to the Canadian Rockies in 2002. For 12 years we worked to improve and perfect this format at the TransRockies Challenge until we launched the Singletrack 6 in 2014. Meanwhile we launched the TransRockies Run in the Colorado Rockies in 2007, and have continued to operate this as a camp-based stage race ever since. Altogether, we’ve operated over 200 days of stage racing in the last 17 years. At TransRockies we pride ourselves in producing challenging, iconic races that enable our participants to focus on their ride and make it to the finish line. At TransRockies Classic we will build upon our years of experience in producing stage races in remote locations. Stage routes are marked with arrows, pin flags, and flagging tape. Riders will need to watch markings carefully to ensure that they are on-course. Each stage will have 2 or 3 checkpoints depending on distance and access. Checkpoints are stocked with water, electrolyte drinks, sports nutrition, fruit, and snacks. Limited mechanical support will also be available as selected checkpoints along the route. Team numbers will be recorded at checkpoints to ensure that all riders are accounted for and teams must arrive together to avoid penalties, according to the official rules. A team of ambassador riders will be on the race course with you. These riders will carry some basic repair parts and tools in case of mechanical and can assist with other minor issues. They will also be in contact with our medical team in case medical attention is required. Our medical team will be present at each start and finish, and will also respond to incidents on course. The medical team may be contact by cell phone in areas where there is coverage, or through other event staff. Each stage will be begin at 8AM and have a daily time limit of 10 hours. Cutoff times will be published for each checkpoint along the route and teams must depart the checkpoints before the cutoff time to continue on the course. Teams not making the cutoff times will mainting an official ranking, but will receive maximum time plus a penalty for the stage. When you cross the finish line each day, our announcer will greet you and snacks and drinks will be nearby. Most days, we are finishing in remote locations with no stores or services, but when we finish in Elkford, Crowsnest and Fernie, you will be able to purchase food and supplies from local businesses. Note that we expect to have cellular/data coverage at the finish of stages 1, 5, 6, and 7, but not following stages 2, 3, or 4. Your numbered TransRockies Duffel Bag will be waiting for you. Simply find your bag and take it to your tent. In the morning, bring your duffel bag back to the bag drop location for transport to the next camp. Our new fleet of Eureka 3-season backpacking tents are ready for you. Teams of two get a 3-person tent with room to spread out. The tent camp is in operation for 6 nights starting on Stage 1. A hot shower is just minutes away at our shower truck. We ask riders to limit their showers to 5 minutes to ensure that everyone gets a shower – water supply is limited in most locations. 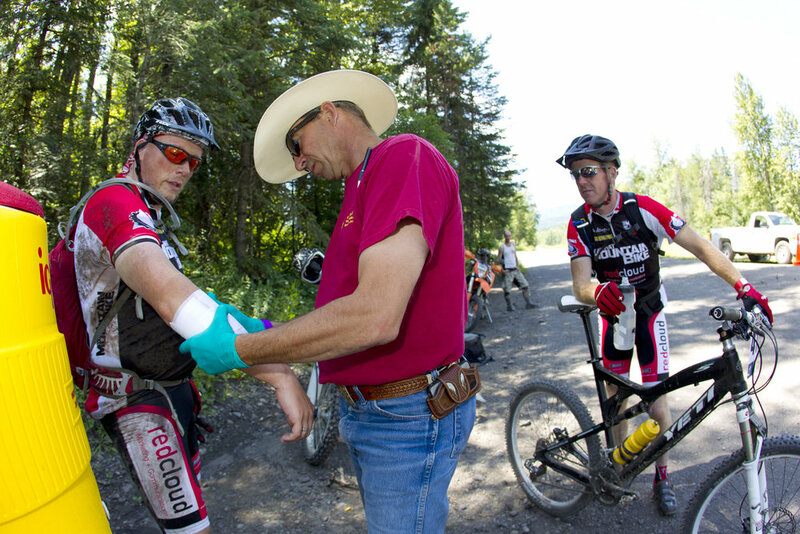 The Bike Therapy mechanic team is back with us for another year – in fact Garry has been at every TransRockies! Along with the regular mechanic setup, they are offering a daily service package so when you cross the finish line each day you can drop your bike with them and they will make it new again by the next morning. It starts with a bike wash and from there they work their magic and make your bike feel like new. A lot can happen on the longer days and the $550 charged for the service covers all of your labour for the week. The Bike Therapy crew also have an impressive parts truck which follows them along the race so if you need anything for your bike chances are they have got you covered. If you have any questions about bike service, please contact: info@biketherapy.com. A Bike Wash station will be set up at all camps. Our team of Registered Massage Therapists will be on-site at every stage. Bookings will be available starting at sign-on in Panorama. Reservations are recommended. $50 per 30 minutes or $95 per 60 minutes. Meals will be hosted either in our meal tent or in the local community hall. Breakfast is served from 5:30 – 7 AM and dinners are served from 5-7 PM daily. Our medical team is available 24 hours per day to assist with any medical issues. The designated zone for socializing in the afternoon and evenings is called Chillville. You can expect music, snacks, and comfy seats around the campfire. One of the most important factors in having a successful stage race is nutrition, both on and off the course. On the course we've got you covered with great products from Planet Foods: Honey Stinger, Ultima, Go Macro and lots of fresh fruit and snacks.